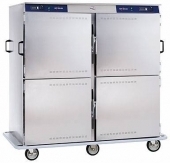 Below is additional information on the hire item "Victor Alto Shaam Holding Oven -192 plates". If you have any questions about this item please feel free to contact our office on or send your question via our contact form. To add this item to your hire estimate enter the number you require in text box and press the "update" button. 6" heavy duty casters; 2 rigid, 4 swivel with brakes. Volume Price £ 252.45 for orders of 4 units or more.